I’ve said it before, and I’m sure I’ll say it again: What is it about Denmark and style? There is so much beautiful design in general, and jewelry in particular, coming out of that country (Pandora, Trollbeads, Lovelinks, Ole Lyngaard, Skagen, etc.). One of the newest brands to emerge, and one that I like a lot, is Blossom Copenhagen. 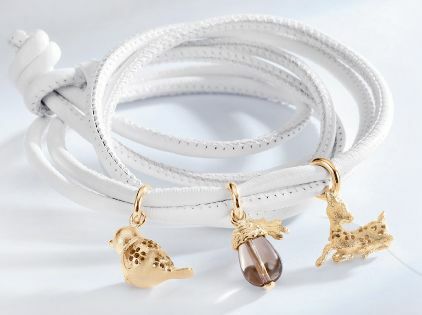 Launched in May of 2011, Blossom Copenhagen features six collections of interchangeable charms and pendants (as well as leather wrist wraps, necklaces and earrings) designed by Christina Lihn, who previously was at Georg Jensen. As I noted in my article about Ole Lyngaard, flexible jewelry seems to be a huge, enduring trend in Danish design, and here we see it again. 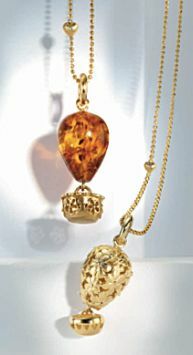 The charms and pendants are all created from Christina’s hand drawn sketches, using traditional goldsmith techniques. The designs have an organic, but soft, feel to them, and the marketing materials (and overall look of the brand) has that delicately feminine and nostalgic “French country / shabby chic” look that is so popular in home decor both in Scandinavia. A recurring theme is hearts – all the collections include at least one heart charm, and Christina herself says “I am a true romantic and I design jewellery for women who love a feminine touch. My favourite symbol is the heart, and that is the focal point of the entire collection”. 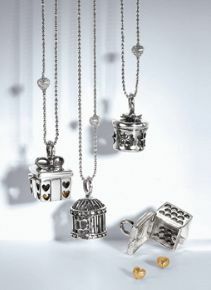 I especially like the “Falling in love you & I” – a different and unique take on the heart charm necklace (and the little charms can hold tiny items), and the hot air balloon-inspired pendants in the Romantic Discovery collection. So far, they are available in Denmark, the UK, the Netherlands and Australia, and I’m sure it’s only a matter of time before they arrive in the US (or at least with an online retailer. I hope I’m right – they’re so pretty, and affordable too. The most expensive piece retails for the equivalent of $130.